Banking, socializing, shopping online and downloading apps make life more convenient and help us stay connected. But that convenience also gives cybercriminals more opportunity to take over our email and bank accounts, and infect our computers or steal our identities. Did you know consumers globally lost $158 billion to cybercrime in the past year? In the United States alone, the figure is nearly $30 billion‡. These cybercriminals are becoming savvier and sophisticated, making it even more important for you to know how to stay safe and secure online. We want to do our part in helping you stay informed when it comes to online banking. That’s why we recently created our Security and Privacy Resource Center where you can go for tools and resources to help protect yourself online. How UMB protects you: explains our strong commitment to your security and details of how we protect you when using our digital products. How to protect yourself: provides you with best practices for mobile devices and other online activity. Preventing identity theft: describes how identity theft occurs, steps to prevent identity theft and what to do if you become a victim of identity theft. Privacy notice: provides you our most current detailed privacy notice. 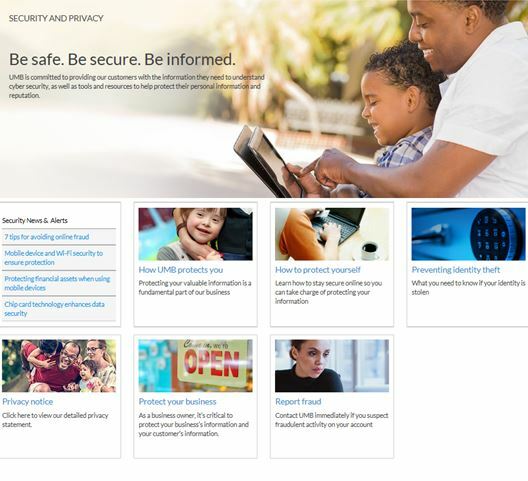 Protect your business: provides our small business customers with 10 common security practices and resources for reducing security risk and the likelihood of fraud as well as information about popular fraud schemes such as the Business Email Compromise (BEC). We hope this provides you useful and meaningful information that you can use in our ever evolving digital world. Be sure to bookmark the Security and Privacy Resource Center so you can easily check back for updates to this new and expanded content.